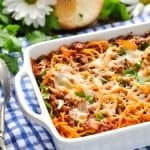 This 5-Ingredient Amish Easy Baked Spaghetti is an easy dinner recipe that your entire family will love! Preheat oven to 350°F (180°C). Spray a large baking dish with cooking spray and set aside. A deep 11 x 7-inch dish works well, but you can also use a 9 x 13-inch dish. Heat about 2 teaspoons of olive oil in a large skillet over medium-high heat. Sautee onion until just tender (about 3-5 minutes). Add ground beef and cook until no longer pink. Drain fat from the skillet. Season with salt and pepper, to taste, and stir in marinara sauce. Meanwhile, cook spaghetti according to package instructions. Drain. Add cooked pasta to the meat sauce and stir to combine. Pour into prepared baking dish. Sprinkle with grated cheese. Bake, uncovered, for about 25-30 minutes. Cooking Just for Two? Just cut all of the ingredients in half and bake the spaghetti in an 8-inch square (or slightly smaller) baking dish. Cooking instructions remain the same. In the alternative, you can prepare the entire recipe, divide the mixture between two small baking dishes (about 8-inch square dishes each), and freeze one of the casseroles for a later date.